When the first Jumanji movie hit theaters in 1995, it didn’t get high marks from critics. It did rake in over $200 million at the box office, though, making it the 10th highest grossing movie of 1995. And, thanks to the spectacularly memorable performances from ’90s icons Robin Williams, Bonnie Hunt, Kirsten Dunst and David Alan Grier, Jumanji managed to imprint itself deeply into the millennial consciousness to the point that if you’re a ’90s kid, you likely have fond memories of the movie. 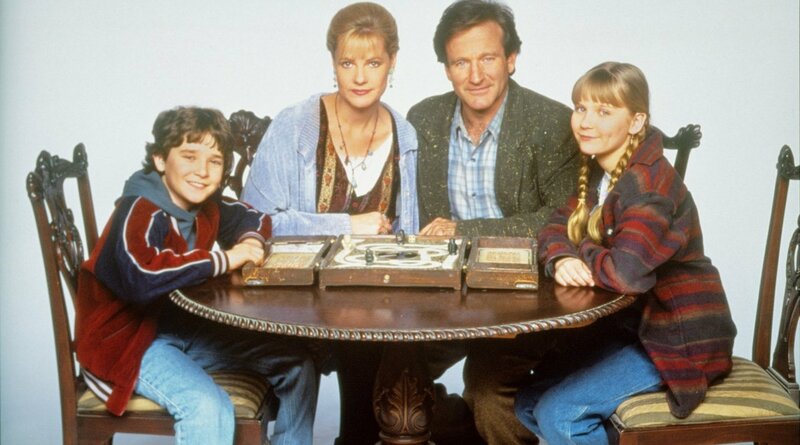 Jumanji came out right before Christmas that year, and it featured Robin Williams as Alan Parrish, a boy who’d been trapped inside the Jumanji board game for 26 years. Then, when Judy and Peter rediscover the game in 1995, Alan comes back from the jungles of Jumanji to help save the day when all manner of wildlife, perilous plants and one angry poacher come to hunt them down. The thrills are nonstop, and you’d be hard-pressed to name a dull moment in this film. Go on, try and do it. I’ll wait. Now, with Jumanji: Welcome to the Jungle in theaters — complete with a new cast, including Dwayne Johnson, Jack Black, Kevin Hart, Karen Gillan and Nick Jonas — we’re revisiting the original and giving you some fun tidbits about the original film. Van Allsburg wrote the books just four years apart, and both featured a child who was taken from their home and forced to face great danger and peril for a very long time. The Jumanji budget was estimated at $50 million, and most of that went to special effects. Despite rumors that an elephant was killed during a stampede scene, none of the animals used in the film were real. Makes sense. In the Jumanji board game, every time a player lands on a space, the effect listed takes place in real life. It also applies to the budget allocation for special effects in the film. Williams often said “Jumanji” was an island in the Caribbean, although he told Entertainment Weekly that was just for laughs. Reportedly, Williams was also a big joker on set. After his passing in 2014, the city set up a small memorial beneath the Parrish Shoes sign, which is still on display. It’s hard to imagine anyone but Kirsten Dunst in Jumanji, but of course, many actors audition for parts. Among the other potentials for the role of Judy was Scarlett Johansson. We wonder how both of these actresses’ careers would have gone had the decision been reversed. Like the role of Judy, several actors were considered for the starring role of Alan Parrish. Apparently, Tom Hanks was at the top of the list. He would go on to voice the part of the conductor in 2004’s The Polar Express, so he did eventually play a role in a Chris Van Allsburg story. The toy company was quick to jump on the success of Jumanji with its version of the game. It included every plot point from the movie and threw players headfirst into the adventure. You can still find it online, as long as you’re willing to pay $100+ for it. It sold for $60,800 and came with a certificate of authenticity signed by director Joe Johnston. Williams’ children were all under the age of 7 when Jumanji first hit theaters. He said he enjoyed working on this type of action film, though, because it was less violent than those aimed at adults. He also thought the plot was weak and that the CGI took all the focus: “Whoever thought this was a family movie (the MPAA rates it PG — not even PG-13!) must think kids are made of stern stuff. The film is a gloomy special-effects extravaganza filled with grotesque images, generating fear and despair.” You can read his full review here. Since the house had to be tidy for the final Christmas scene, they filmed that first. Then they slowly destroyed the house during filming. It lasted just three seasons, from 1996 to 1999. You can buy the entire series on DVD for less than $10 on Amazon. Although the original trailer makes the new Jumanji seem like a reboot, it actually takes place in the same universe as the 1995 film. The extended trailer clarifies that.